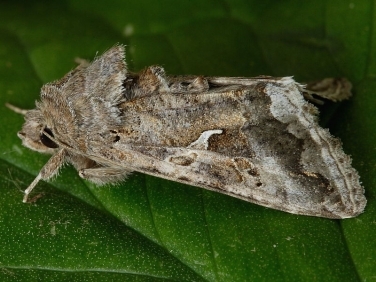 The Silver Y moth is one of the commonest migrant moth species to arrive in the British Isles. In favourable conditions millions of immigrant moths arrive, reaching the northern most parts of the UK. The species is distributed throughout much of the world including Europe, North Africa and parts of south east Asia. 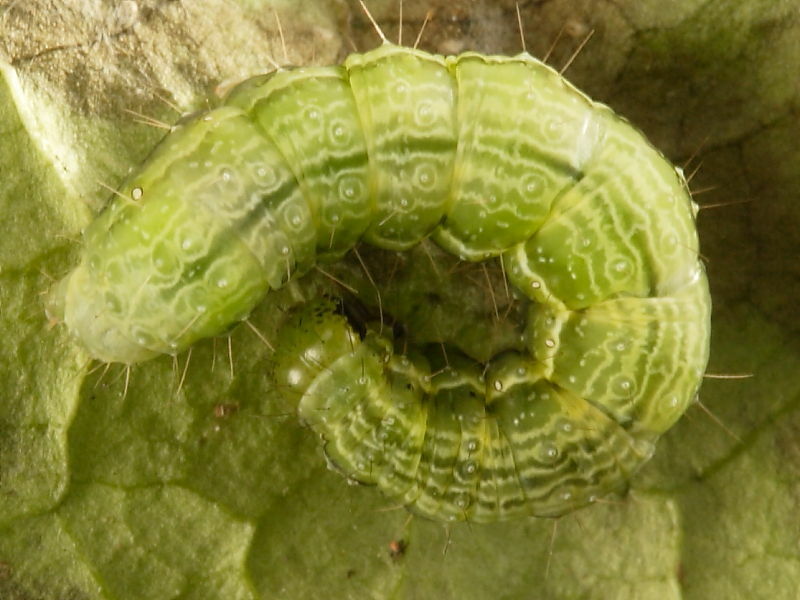 Along with the closely related Ni Moth, Trichoplusia ni, the caterpillars are considered pests of brassica crops and other vegetables and often referred to as cabbage loopers. The Silver Y has a variable wingspan of between 30 – 45 mm and is one of the most commonly seen daytime flying moths. It is most easily recognised by its metallic sheen and the complete creamy/white/silver mark in the centre of its forewing resembling a letter Y. Other similar species in the Plusiinae moth family can normally be identified by a broken Y or variation in the shape of this distinctive wing marking. 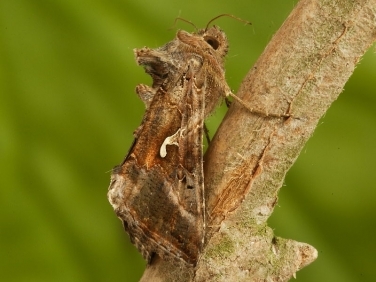 The colour variation of the adult Silver Y is thought to be influenced by the temperature at the time of the caterpillar’s development. The pale form f. pallida, is considered to have developed in warmer climates before migrating to the cooler Uk. Migrant moths can be recorded in any month of the year but most arrive between late Spring and end of October. Numbers peak in late summer and early Autumn when migrants from the continent combine with the emerging broods of earlier arrivals. The moths are attracted to light but many more can often be disturbed during the day from low vegetation or seen nectaring on a wide variety of flowers including heathers, knapweed, lavender, thrift and buddleias. Eggs are laid in singles or small groups on the underside of leaves of the larval food plant and, depending on temperature, may hatch in as little as 7 days. The caterpillars are fully grown in 30 days during which time they have four instars and feed on the under side of leaves. 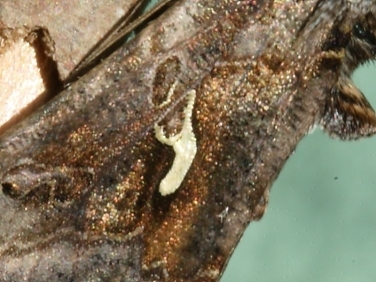 The time between an egg being laid the adult moth emerging is about 8 weeks. Caterpillars of later broods are normally killed by the first frosts but some may over winter in parts of the south. The identification of the silver Y caterpillar is helped by it only having two sets of prolegs and a rear clasper, causing it to walk with an arched body. This arrangement of pro legs is only found in a few species of caterpillars in the British Isles. 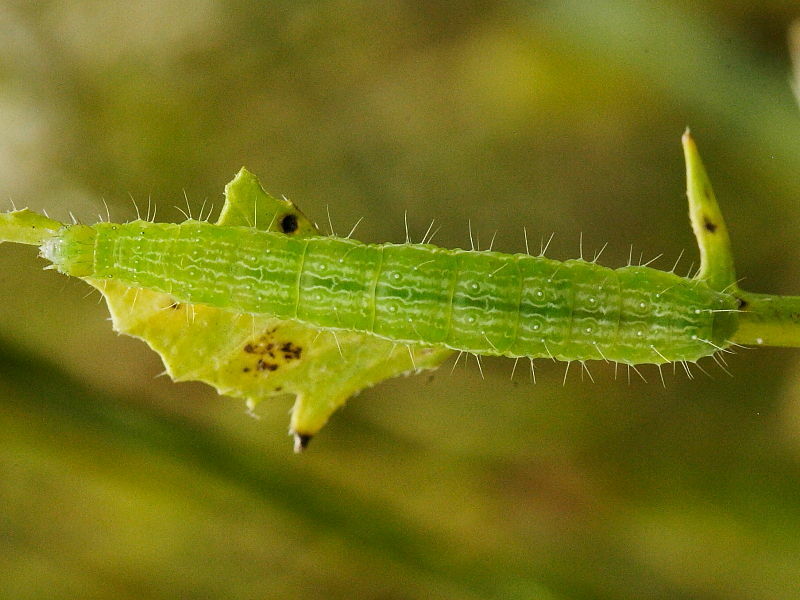 The commonly recorded ‘looping’ caterpillars of the large family of Geometridae moths are mostly of much slighter build and have only one proleg and a rear clasper. 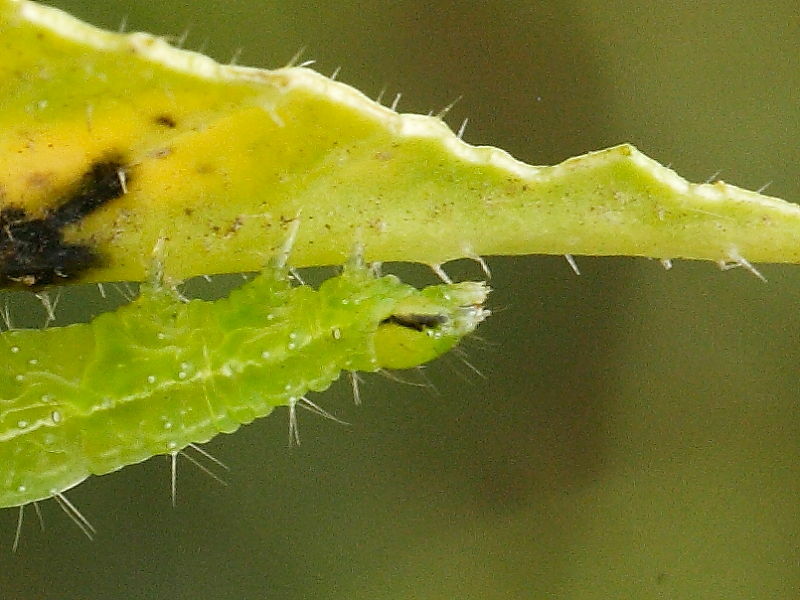 In early instars the caterpillars are green with a series of white wavy lines, slightly muddied green head and short black setae. In later instars the pale wavy dorsal lines are broken on each segment by small concentric pale and green circles centred on a small pale dot. A darker green dorsal line, a pale spiracular line edged in dark green above and short black stripe on the side of the head can also be useful identifying features, although the latter feature can be absent. The caterpillars are polyphagous, feeding on many low lying herbaceous plants including nettles, dock, bedstraws, dandelion, common toadflax and clovers. 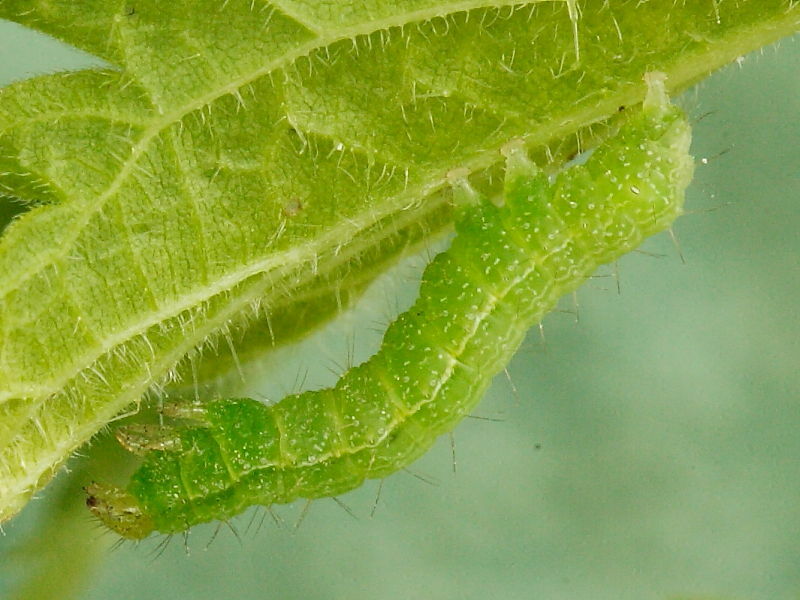 The full extent of the different varieties of larval food plants in the Uk is unknown but seems likely to include hundreds of different plant species. 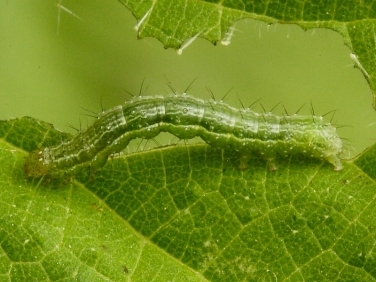 The caterpillars are also commonly found feeding on cultivated food crops and imported plants. The fully grown caterpillars spin a light cocoon in either plant litter or amongst the leaves and stems of the larval food plant or nearby plant. On occasions the pupa is secured to a stem by only a few threads of silk. 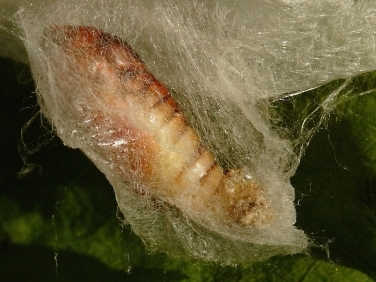 The adult moth emerges within 14 days dependant on temperature. The life expectancy of an emerging moth is thought to be about three weeks. This species is easy to rear. Caterpillars can be found during the day by either searching or sweeping low lying larval food plants. Females lay readily in captivity on larval food plants. The Silver Y caterpillar is one of several caterpillar pests of vegetables and other cultivated crops found throughout the British Isles, most of Europe, north Africa and south east Asia. The distribution of the Silver Y is predominately over the dry and temperate parts of the world. However, given this insects strong migratory instinct, it seems likely that the Silver Y will extend its range should climate warming persist. This range extension may include North America either naturally or by unintentional introduction. Already in North America its close relative the Ni moth is a major pest. 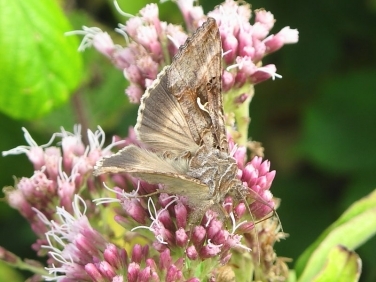 Identifying The Silver Y from the Ni Moth is best done by comparing the metallic Y markings, the latter species often having a disconnected Y. The Cabbage Looper and Beet Worm are alternative names used for the Silver Y caterpillar because of the damage it causes in particular to brassica and beet crops. 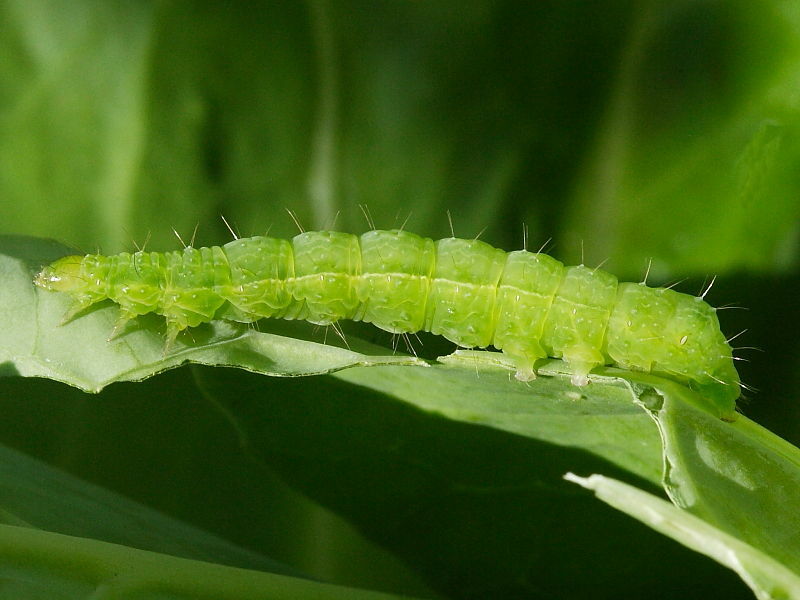 In the British Isles the caterpillars are frequently found in vegetable gardens and allotments feeding on peas, runner beans, cabbages, broccoli, tomatoes, salad leaves, mint and many other cultivated produce. Farmed sugar beet, peas and cabbage crops are particularly vulnerable and in favourable migrating weather and warm summers numbers can reach plague proportions resulting in severe crop damage unless treated. The Silver Y has also been recorded arriving in the country as eggs, caterpillars and pupae transported on plants imported by super markets and garden centres. The Colour identification guide to caterpillars of the British Isles by Jim Porter. The Field guide to the Moths of Great Britain and Ireland by Waring,Townsend and Lewington.